At Cambridge-Dorchester Airport, the summers are warm and muggy, the winters are very cold and windy, and it is wet and partly cloudy year round. Over the course of the year, the temperature typically varies from 28°F to 87°F and is rarely below 16°F or above 94°F. Based on the tourism score, the best times of year to visit Cambridge-Dorchester Airport for warm-weather activities are for the entire month of June and from early August to early October. The hot season lasts for 3.5 months, from May 31 to September 16, with an average daily high temperature above 78°F. The hottest day of the year is July 21, with an average high of 87°F and low of 69°F. The cold season lasts for 3.3 months, from December 2 to March 12, with an average daily high temperature below 53°F. The coldest day of the year is January 31, with an average low of 28°F and high of 44°F. Voltana, Italy (4,345 miles away); Oraiókastro, Greece (4,958 miles); and Shorapani, Georgia (5,688 miles) are the far-away foreign places with temperatures most similar to Cambridge-Dorchester Airport (view comparison). At Cambridge-Dorchester Airport, the average percentage of the sky covered by clouds experiences mild seasonal variation over the course of the year. The clearer part of the year at Cambridge-Dorchester Airport begins around July 12 and lasts for 4.3 months, ending around November 22. On October 12, the clearest day of the year, the sky is clear, mostly clear, or partly cloudy 64% of the time, and overcast or mostly cloudy 36% of the time. The cloudier part of the year begins around November 22 and lasts for 7.7 months, ending around July 12. On January 5, the cloudiest day of the year, the sky is overcast or mostly cloudy 52% of the time, and clear, mostly clear, or partly cloudy 48% of the time. A wet day is one with at least 0.04 inches of liquid or liquid-equivalent precipitation. The chance of wet days at Cambridge-Dorchester Airport varies throughout the year. The wetter season lasts 4.8 months, from April 2 to August 27, with a greater than 30% chance of a given day being a wet day. The chance of a wet day peaks at 39% on August 4. The drier season lasts 7.2 months, from August 27 to April 2. The smallest chance of a wet day is 21% on October 20. Among wet days, we distinguish between those that experience rain alone, snow alone, or a mixture of the two. Based on this categorization, the most common form of precipitation throughout the year is rain alone, with a peak probability of 39% on August 4. To show variation within the months and not just the monthly totals, we show the rainfall accumulated over a sliding 31-day period centered around each day of the year. Cambridge-Dorchester Airport experiences some seasonal variation in monthly rainfall. Rain falls throughout the year at Cambridge-Dorchester Airport. The most rain falls during the 31 days centered around August 11, with an average total accumulation of 3.7 inches. The least rain falls around January 30, with an average total accumulation of 2.4 inches. As with rainfall, we consider the snowfall accumulated over a sliding 31-day period centered around each day of the year. Cambridge-Dorchester Airport experiences some seasonal variation in monthly liquid-equivalent snowfall. The snowy period of the year lasts for 3.5 months, from December 2 to March 20, with a sliding 31-day liquid-equivalent snowfall of at least 0.1 inches. The most snow falls during the 31 days centered around January 23, with an average total liquid-equivalent accumulation of 0.4 inches. The snowless period of the year lasts for 8.5 months, from March 20 to December 2. The least snow falls around July 20, with an average total liquid-equivalent accumulation of 0.0 inches. The length of the day at Cambridge-Dorchester Airport varies significantly over the course of the year. In 2019, the shortest day is December 21, with 9 hours, 28 minutes of daylight; the longest day is June 21, with 14 hours, 52 minutes of daylight. The earliest sunrise is at 5:39 AM on June 14, and the latest sunrise is 1 hour, 52 minutes later at 7:31 AM on November 2. The earliest sunset is at 4:42 PM on December 7, and the latest sunset is 3 hours, 50 minutes later at 8:32 PM on June 28. Daylight saving time (DST) is observed at Cambridge-Dorchester Airport during 2019, starting in the spring on March 10, lasting 7.8 months, and ending in the fall on November 3. Cambridge-Dorchester Airport experiences extreme seasonal variation in the perceived humidity. The muggier period of the year lasts for 4.2 months, from May 23 to September 30, during which time the comfort level is muggy, oppressive, or miserable at least 17% of the time. The muggiest day of the year is July 20, with muggy conditions 69% of the time. The least muggy day of the year is January 31, when muggy conditions are essentially unheard of. The average hourly wind speed at Cambridge-Dorchester Airport experiences significant seasonal variation over the course of the year. The windier part of the year lasts for 7.0 months, from October 9 to May 10, with average wind speeds of more than 9.2 miles per hour. The windiest day of the year is February 26, with an average hourly wind speed of 11.3 miles per hour. The calmer time of year lasts for 5.0 months, from May 10 to October 9. The calmest day of the year is July 27, with an average hourly wind speed of 7.1 miles per hour. The predominant average hourly wind direction at Cambridge-Dorchester Airport varies throughout the year. The wind is most often from the north for 1.7 months, from February 7 to March 30 and for 1.1 months, from October 12 to November 15, with a peak percentage of 33% on February 12. The wind is most often from the south for 6.4 months, from March 30 to October 12, with a peak percentage of 40% on July 28. The wind is most often from the west for 2.7 months, from November 15 to February 7, with a peak percentage of 35% on January 1. Cambridge-Dorchester Airport is located near a large body of water (e.g., ocean, sea, or large lake). This section reports on the wide-area average surface temperature of that water. The average water temperature experiences significant seasonal variation over the course of the year. The time of year with warmer water lasts for 3.4 months, from June 21 to October 2, with an average temperature above 69°F. The day of the year with the warmest water is August 9, with an average temperature of 77°F. The time of year with cooler water lasts for 3.6 months, from December 20 to April 6, with an average temperature below 46°F. The day of the year with the coolest water is February 10, with an average temperature of 38°F. To characterize how pleasant the weather is at Cambridge-Dorchester Airport throughout the year, we compute two travel scores. The tourism score favors clear, rainless days with perceived temperatures between 65°F and 80°F. Based on this score, the best times of year to visit Cambridge-Dorchester Airport for general outdoor tourist activities are for the entire month of June and from early August to early October, with a peak score in the first week of September. The beach/pool score favors clear, rainless days with perceived temperatures between 75°F and 90°F. Based on this score, the best time of year to visit Cambridge-Dorchester Airport for hot-weather activities is from late June to early September, with a peak score in the third week of July. The growing season at Cambridge-Dorchester Airport typically lasts for 7.1 months (219 days), from around March 30 to around November 4, rarely starting before March 9 or after April 18, and rarely ending before October 17 or after November 22. Based on growing degree days alone, the first spring blooms at Cambridge-Dorchester Airport should appear around March 20, only rarely appearing before March 2 or after April 7. The average daily incident shortwave solar energy experiences significant seasonal variation over the course of the year. The brighter period of the year lasts for 3.8 months, from April 25 to August 20, with an average daily incident shortwave energy per square meter above 6.0 kWh. The brightest day of the year is June 23, with an average of 7.0 kWh. The darker period of the year lasts for 3.1 months, from November 6 to February 9, with an average daily incident shortwave energy per square meter below 3.0 kWh. The darkest day of the year is December 23, with an average of 2.0 kWh. For the purposes of this report, the geographical coordinates of Cambridge-Dorchester Airport are 38.539 deg latitude, -76.032 deg longitude, and 10 ft elevation. The topography within 2 miles of Cambridge-Dorchester Airport is essentially flat, with a maximum elevation change of 26 feet and an average elevation above sea level of 13 feet. Within 10 miles is also essentially flat (66 feet). Within 50 miles is essentially flat (295 feet). The area within 2 miles of Cambridge-Dorchester Airport is covered by cropland (47%), trees (39%), and artificial surfaces (10%), within 10 miles by cropland (45%) and trees (30%), and within 50 miles by cropland (32%) and trees (30%). This report illustrates the typical weather at Cambridge-Dorchester Airport, based on a statistical analysis of historical hourly weather reports and model reconstructions from January 1, 1980 to December 31, 2016. Cambridge-Dorchester Airport has a weather station that reported reliably enough during the analysis period that we have included it in our network. When available, historical temperature and dew point measurements are taken directly from this weather station. These records are obtained from NOAA's Integrated Surface Hourly data set, falling back on ICAO METAR records as required. 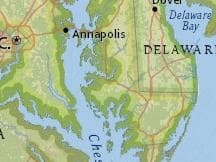 The stations on which we may fall back include but are not limited to Easton Airport; Naval Air Station Patuxent River; Thomas Point Coast Guard Station; Salisbury–Ocean City–Wicomico Regional Airport; Webster Nolf Airport; Annapolis, United States Naval Academy; Sussex County Airport; and Wallops Flight Facility.